Corey Bauman inside her downtown children’s store Mac & Madi’s. 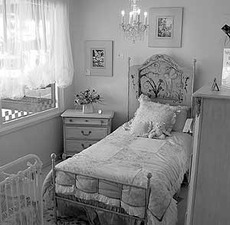 A sugar ‘n spice and everything nice, nursery rhyme kind of place has bedded down in San Clemente. Its name? Mac and Madi, a one-stop shopping emporium catering to the village young. Inside this unique children’s boutique visions of sugarplums dance in your head, and like a kid in a candy store you want to buy everything in sight. 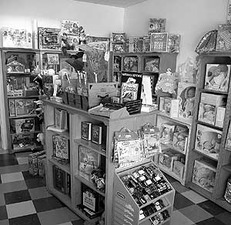 Each nook and cranny is filled with the things childhood dreams are made of, and this is a shoppe designed to make the dreams of young and old come true. Corey Bauman, started it all with a dream of her own - to bring a store to the village unlike any other. A shop where proud-to-own, high quality, made-to-last children’s furniture, clothing, toys and accessories could be purchased under one roof. A place where busy consumers could find it all – myriad selections, gift wrapping, personalized customer service, special ordering privileges and interior design consultations. Capitalizing on the need for an upscale children’s store on the Avenida, Corey began her search for just the right place. Soon she discovered an empty office building in the 200 block of Del Mar. The vacated space fulfilled her vision of a shop with a large central area and additional small rooms. Construction completed, Corey quickly began filling the main body of the boutique with colorful, quality children’s clothing, shoes, hats and jewelry, providing choices from pre-birth to ‘tweens. Then she featured designer vignettes with bedroom furniture and accessories for children, in the individual rooms on its perimeter, completing the picture with a spa and bath nook, infants’ room and an arts, crafts and toy area. Bauman’s children, Mac, 9-yrs-old, and Madi, “her 5-yr-old princess,” were her inspiration and are testers for the quality and desirability of her products. “I don’t sell anything in the store that I wouldn’t want for my own family,” she said. Corey emphasized that price points, the affordability factor, are also an important consideration in her business. Though her merchandise standards are high, she works hard to have a broad monetary range for all income levels. A separate “sale” room featuring reduced goods occupies space in the rear of the store. San Clemente's laid-back lifestyle, the sun, sand and sea, drew the Bauman family to the village 5 1/2 years ago. Before that Corey was an event planner for a large corporation. Once in town she began painting and decorating furniture and consulting as an interior designer for children‚s rooms. Thus the stage was set, the curtain ascended and Corey Bauman has put it all together, sharing her talents and gracing our town with a retail shop called Mac and Madi.